1 Let’s begin by getting your pot nice and hot and then mixing the water, onions, tomatoes, salt, pepper, liempo, gabi and kamote. Let this mixture boil before bringing it to a simmer. Now, throw in the Knorr Sinigang sa Sampalok Mix Original and simmer again for 5 to 10 minutes. 2 This dish isn’t complete until you add Knorr Complete Recipe Mix Ginataang Gulay. You’ve got to simmer until the pork is tender and then add the string beans next. Finally, wait for a few minutes more before adding the pechay. 3 Who says you can’t have the best of both worlds? 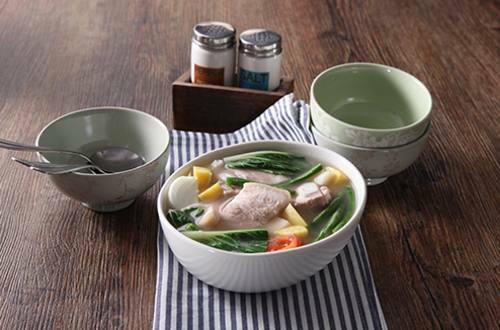 With Sinigang and Gata, it’s a match made in heaven!